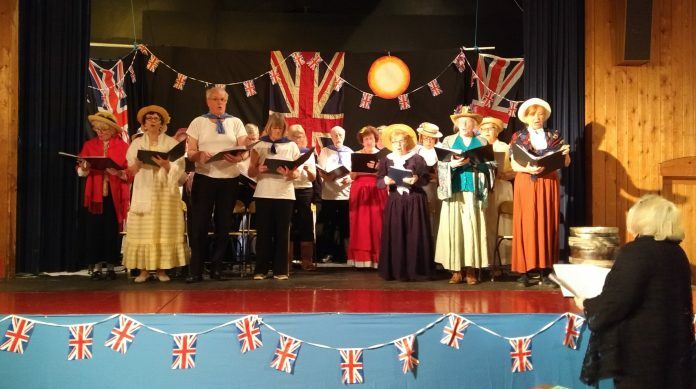 In a two-part concert held in the Community Centre on Saturday, March 16, the Ryesingers performed excerpts from Gilbert and Sullivan’s Gondoliers followed, after the interval, by songs from Rodgers and Hammerstein. With its theme of love and marriage, the songs from the Gondoliers, performed in costume and accompanied just by a piano, were linked by a spoken narration to keep the plot flowing. Of note was Rhiannon Chillingworth in a major part as ‘Casilda’ a duchess’s daughter complete in her wedding dress: a white corset attached to a pastel rainbow elegant skirt. Illness had hit the cast shortly before the performance but the very competent Dennis Farnsworth stepped into the role of one of the main characters, Antonio, and Anne Whiteman directed in place of the unwell Leslie Brownbill. Following the interval, the singers reappeared, this time in blue tops and trousers and gave the audience a masterly performance of popular songs from Rodgers and Hammerstein. Overall, a great afternoon to chill and listen to a class performance from within our Rye community.